First, let me say that Pluto should never have been downgraded to the status of “dwarf planet”. The recent (and ongoing) discoveries by NASA’s New Horizons probe show Pluto’s full, planetary glory: kilometer high mountains, flowing glaciers, atmospheric haze, organic compounds, complex and colorful landforms. So, in my mind Pluto still remains as the ninth planet in our beautiful solar system. However, many astronomers have moved on and are getting excited over the possibility of a new Planet Nine. The evidence for its existence is mounting and comes mostly from models that infer the presence of a massive object far-beyond Pluto, which is influencing the orbits of asteroids and even some of the outer planets. Just this month, evidence from the Cassini spacecraft orbiting Saturn helped close in on the missing planet. Many experts suspect that within as little as a year someone will spot the unseen world, which would be a monumental discovery that changes the way we view our solar system and our place in the cosmos. “Evidence is mounting that something unusual is out there—there’s a story that’s hard to explain with just the standard picture,” says David Gerdes, a cosmologist at the University of Michigan who never expected to find himself working on Planet Nine. He is just one of many scientists who leapt at the chance to prove—or disprove—the team’s careful calculations. Batygin and Brown made the case for Planet Nine’s existence based on its gravitational effect on several Kuiper Belt objects—icy bodies that circle the sun beyond Neptune’s orbit. Theoretically, though, its gravity should also tug slightly on the planets. * With this in mind, Agnès Fienga at the Côte d’Azur Observatory in France and her colleagues checked whether a theoretical model (one that they have been perfecting for over a decade) with the new addition of Planet Nine could better explain slight perturbations seen in Saturn’s orbit as observed by Cassini. * Without it, the other seven planets in the solar system, 200 asteroids and five of the most massive Kuiper Belt objects cannot perfectly account for it. * The missing puzzle piece might just be a ninth planet. The good news does not end there. If Planet Nine is located toward the constellation Cetus, then it could be picked up by the Dark Energy Survey, a Southern Hemisphere observation project designed to probe the acceleration of the universe. “It turns out fortuitously that the favored region from Cassini’s data is smack dab in the middle of our survey footprint,” says Gerdes, who is working on the cosmology survey. * “We could not have designed our survey any better.” Although the survey was not planned to search for solar system objects, Gerdes has discovered some (including one of the icy objects that led Batygin and Brown to conclude Planet Nine exists in the first place). 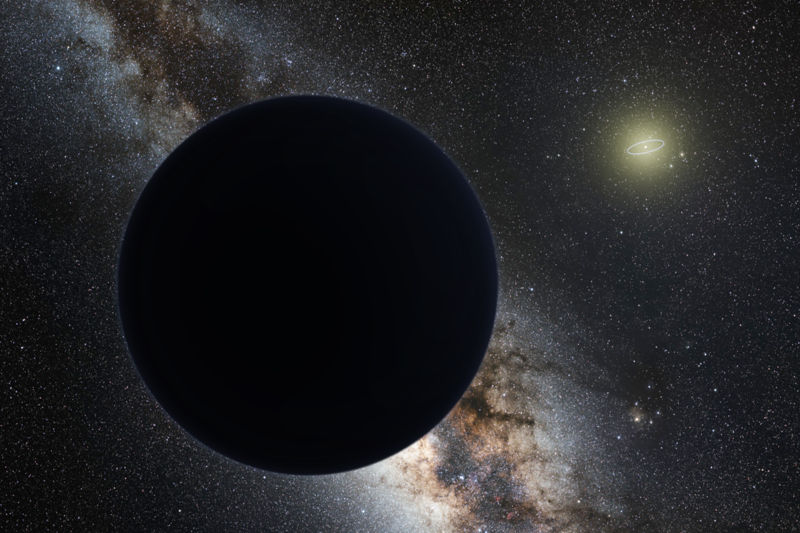 Image: Artist’s impression of Planet Nine as an ice giant eclipsing the central Milky Way, with a star-like Sun in the distance. Neptune’s orbit is shown as a small ellipse around the Sun. Courtesy: Tomruen, nagualdesign / Wikipedia. Creative Commons.